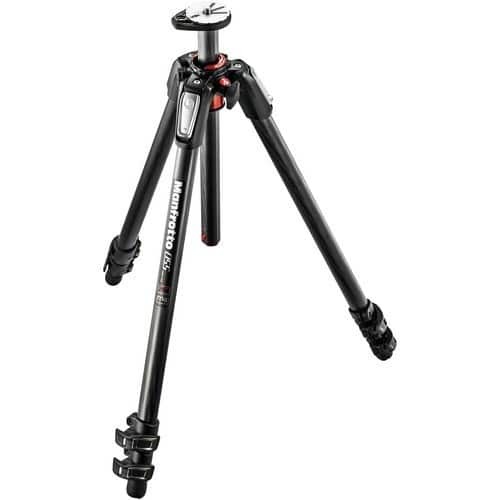 The Manfrotto MT055CXPRO3 Carbon Fiber Tripod is a 3-section support that replaces the 055CXPRO3 tripod. It has a load capacity of 19.8 lb and extends from 3.5" to 66.9". Its carbon fiber legs are secured by the Quick Power Locks. These updated flip locks increase the tripod's rigidity by 50% compared to its predecessor. A redesigned center column has a "one finger" operation, and includes an Easy Link 3/8"-16 attachment for attaching accessories such as an LED light or a reflector via a compatible arm. The center column can be positioned horizontally, allowing for low-angle and macro photography. The upper disc where a tripod head is mounted has been redesigned as well, and now has a bull's eye bubble level that rotates 360° so you can locate it where you can see it. This allows you to level your camera on both the horizontal and vertical planes.